Show your love for the hobby with this flashy new automotive license plate frame that tells the world how you feel about pinball! 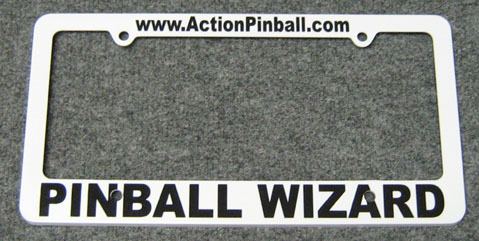 PINBALL WIZARD in large easy-to-read black text printed on white background. Plastic frame fits around US/Canada/North America and similar style license plates. Each frame has 4 screw holes for mounting on 2- or 4-screw license plates and vehicle mountings. Overall measurements: 12-3/8 x 6-1/4 inches. Buyer is responsible for proper mounting over automotive license plate to ensure any state-issued registration information/stickers remain properly displayed.